By 1914 Egypt had been part of the Ottoman Empire for 400 years, remaining under nominal Ottoman suzerainty despite being occupied by the British in 1882, following the Anglo-Egyptian War, and eventually becoming a British protectorate. The Suez Canal was of vital strategic importance to the British, reducing the sailing time from India, New Zealand and Australia to Europe. As a result Egypt became a major base during the war, particularly during the Gallipoli campaign. To Germany and the Ottoman Empire the canal was the closest and weakest link in British communications. Defence of the canal posed a number of problems, with its sheer size alone making it hard to control. There was no road from Cairo, while only one railway track crossed the 30 miles (48 km) of desert from Cairo to Ismaïlia on the canal before branching north to Port Said and south to Suez. Control of the central area around Ismaïlia was of great strategic importance because these three canal towns relied on fresh water from the Nile via the Sweet Water Canal to the main gates and sluices near there. At the beginning of hostilities between Britain and the Ottoman Empire in November 1914, the 30,000 strong British defence force evacuated the part of the Sinai Peninsula that was east of the canal, concentrating their defences on the western side of the canal. 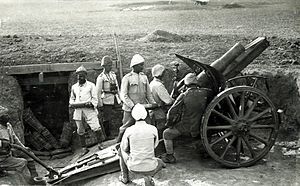 The British force comprised the 10th, and 11th Indian Divisions, the Imperial Service Cavalry Brigade, the Bikaner Camel Corps, three batteries of Indian mountain artillery and one Egyptian artillery battery. These were supported by the guns of Allied ships in the canal. Opposing them were around 25,000 men, including the 25th Division. The Ottoman Empire demonstrated its interest in being reinstated in Egypt in 1915 when Ottoman forces attacked British forces in Egypt. The Germans also helped to foment unrest among the Senussi in what is now Libya, when they attacked western Egypt and threatened the Sudan during the Senussi Campaign. At the conclusion of the Battle of Romani on 12 August 1916, the Ottoman Army had been pushed back to its forward position at Bir el Abd, the last oasis in the series stretching from the Romani area. The Ottomans' main forward base was pushed back to El Arish, with a fortified advanced post at Bir el Mazar, where a small group of wells which reliably provided water. El Arish was the target of an air raid on 18 June 1916 by 11 aircraft of the 5th Wing under Colonel W. G. H. Salmond. The planes flew out to sea until east of El Arish, then turned inland to approach from the southeast. Two Ottoman aircraft on the ground and two of the ten aircraft hangars were set on fire; bombs hit four others and troops were also attacked. Three British aircraft were forced to land, one in the sea. Although the front had moved eastwards across the Sinai, it was still necessary to maintain defence units on the Canal. While serving as part of Canal Defence at Gebel Heliata, Serapeum, the 12th Light Horse Regiment commemorated 28 August: "Today being the Anniversary of the Regiment landing on Gallipoli, a little latitude was given to all hands, and an enjoyable evening was spent in the men's canteen." By September 1916, the German and Ottoman Empires had renegotiated their agreements to recognise the increasing Ottoman forces being deployed in Europe, while German and Austrian aid and equipment was increased to strengthen the Ottoman army in Palestine. German aircrews of the Luftstreitkräfte bombed Port Said on 1 September 1916 and Australian and British airmen answered with a bombing raid on Bir el Mazar three days later, when twelve bombs silenced the anti-aircraft guns and blew several tents to pieces. Bir el Mazar was again bombed on 7 September. As part of the advance across the Sinai, the Australian Flying Squadron's "B" Flight moved their hangars from Suez forward to Mahemdia (4 miles from Romani) on 18 September; "C" Flight moved to Kantara on 27 September 1916. Advances in military medical techniques included the surgical cleaning (or debridement) of wounds, with delayed primary surgical closure, the Thomas Splint which stabilized compound leg fractures, the use of intravenous saline which had begun in 1916 and blood transfusions to prevent or even reverse the effects of shock. Casualties were transported from the regimental aid post close to the firing line to an advanced dressing station in the rear by the stretcher bearers of the field ambulances attached to the light horse and mounted brigades. Evacuations back to the railway line which stretched across the Sinai, were undertaken in horse-drawn ambulances, in sand sledges or in cacolets on camels, which was described as "a form of travel exquisite in its agony for wounded men because of the nature of the animal's movement". There was a progressive improvement in horsemanship during the summer and autumn of 1916 indicated by the small number of animals evacuated from the Anzac Mounted Division after the strenuous marching and fighting from August after the Battle of Romani, during the capture of El Arish and the Battle of Magdaba. This improvement was augmented by regular inspections by administrative veterinary officers when the advice offered was followed by regimental commanders. During the year the average loss of sick horses and mules from the Sinai front was approximately 640 per week. They were transported in train loads of thirty trucks, each holding eight horses. Animals which died or were destroyed while on active service were buried 2 miles (3.2 km) from the nearest camp unless this was not practicable. In this case the carcasses were transported to suitable sites away from troops, where they were disembowelled and left to disintegrate in the dry desert air and high temperatures. Animals which died or were destroyed in veterinary units at Kantara, Ismalia, Bilbeis and Quesna were dealt with in this way and after four days' drying in the sun, the carcases were stuffed with straw and burnt, after the skins were salvaged and sold to local contractors. In September 1916, General Murray moved his headquarters from Ismailia on the Suez Canal back to Cairo in order to deal more efficiently with the threat from the Senussi in the Western Desert. General Lawrence was transferred to France where he served as Chief of Staff to Field Marshal Haig in 1918. Field Marshal William Robertson, the Chief of the Imperial General Staff, set out his global military policy at this time in a letter to Murray of 16 October 1916, in which he stated "I am not intent on winning in any particular quarter of the globe. My sole object is to win the war and we shall not do that in the Hedjaz nor in the Sudan. Our military policy is perfectly clear and simple ... [It] is offensive on the Western Front and therefore defensive everywhere else". In this climate of defensive military policy, Major-General Sir Charles Dobell, who had acquired a reputation for sound work in minor operations, was promoted to the rank of lieutenant-general, given the title of GOC Eastern Frontier Force and put in charge of all the troops on the canal and in the desert. His headquarters was established at Ismailia and he began to organised his command into two parts, the Canal Defences and Desert Column. In October, Eastern Force began operations into the Sinai desert and on to the border of Palestine. Initial efforts were limited to building a railway and a waterline across the Sinai. The railway was constructed by the Egyptian Labour Corps at the rate of about 15 miles (24 km) a month and the British front moved eastward at the same speed. By 19 October the Anzac Mounted Division Headquarters was at Bir el Abd where the 52nd (Lowland) Division joined them on 24 October. On 11 November a Martinsyde and nine B.E.2c's, loaded with bombs and petrol, left the Kantara and Mahemdia aerodromes at dawn and assembled at Mustabig, just west of Bir el Mazar. There a raiding force of five B.E.2c's and the Martinsyde formed the largest force yet organised by Australians or any other air squadron in the East, filled up with petrol and bombs and set off in formation towards Beersheba. Over Beersheba the anti-aircraft guns engaged them with high explosive and shrapnel; the raiders flew through a flurry of white, black and green bursts. The Martinsyde dropped a 100 lb (45 kg) bomb fair in the centre of the aerodrome; two 20 lb (9.1 kg) bombs hit tents; others made direct hits on the railway to Beersheba and the station. A Fokker and an Aviatik took to the air but were driven off. After photographing Beersheba and the damage caused by the bombs, the airmen returned, reconnoitring Khan Yunis and Rafa on the way. All machines arrived safely, after having spent seven hours in flight. Two days later a German aeroplane retaliated by bombing Cairo. On 17 November EEF railhead reached 8 miles (13 km) east of Salmana 54 miles (87 km) from Kantara, the water pipeline with its complex associated pumping stations built by Army Engineers and the Egyptian Labour Corps had reached Romani. Bir el Mazar, formerly the forward base of the Ottoman Army was taken over by the Anzac Mounted Division on 25 November 1916 the day before railhead. By 1 December the end of the most recently laid railway line was east of Mazar 64 miles (103 km) from Kantara. The Ottomans constructed a branch railway line running south from Ramleh, on the Jaffa–Jerusalem railway, to Beersheba, by relaying rails taken from the Jaffa–Ramleh line. German engineers directed the construction of stone ashlar bridges and culverts when the line was extended from Beersheba. It had almost reached the Wadi el Arish in December 1916 when Magdhaba was captured. After tough fighting in the morning of 23 December, at about 13:00, Chauvel heard that the Turks still controlled most of the water in the area. It is claimed at this time that he decided to call off the attack. But at about the same time, after a telephone conversation between Chauvel and Chetwode, all British units attacked, and there was no doubt that the Turks were losing. Both the 1st Light Horse Brigade and the New Zealand Mounted Rifles Brigade made progress, capturing about 100 prisoners, and by 15:30 the Turks were beginning to surrender. By 16:30 the whole garrison had surrendered, having suffered heavy casualties, and the town was captured. The victory had cost the EEF 22 dead and 121 wounded. Military situation immediately prior to the release of the Balfour Declaration. From 1 to 6/7 November strong Ottoman rearguards at Tel el Khuweilfe in the Judean Hills, at Hareira and Sheria on the plain and at Sausage Ridge and Gaza on the Mediterranean coast held the Egyptian Expeditionary Force in heavy fighting. During this time the Ottoman Armies were able to withdraw in good order covered by strong rearguard garrisons, which themselves were able to retire under cover of darkness on the night of 6/7 November. The British Yeomanry cavalry Charge at Huj was launched against an Ottoman rearguard on 8 November. Allenby ordered the Egyptian Expeditionary Force to advance and capture the retreating Ottoman Seventh and Eighth Armies, but they were prevented from doing so by the strong rearguards. ^ Allenby wrote to Robertson on 25 January 1918: "If I could destroy 10 or 15 miles of rail and some bridges and get touch with the Arabs under Feisal – even temporarily – the effect would be great." [Allenby letter to Robertson 25 January 1918 in Hughes 2004, p. 127] Fifteen miles of railway including all bridges were destroyed on 23 May 1917 on the railway from Beersheba to Auja. [Wavell 1968, p. 90 & Powles 1922, pp. 110, 113] For a description of the procedure used to destroy the rails see Powles 1922, p. 112. ^ A comparison of Falls' Sketch Maps 18 and 30 shows that the front line was pushed north into the Judean Hills by about 5 miles (8.0 km) between the end of December 1917 and September 1918, to eventually follow the Nahr el Auja east from the Mediterranean coast, along the Wadi Deir Ballut and as a result of the capture of Jericho and occupation of the Jordan Valley, along the Wadi el Auja to the Jordan River. ^ See Indian Army during World War I for an image of Indian lancers, and for an illustration of a fully armed lancer with sword, lance, rifle, bayonet and gas mask, see Chappell's "Men at Arms Series British Cavalry Equipment 1800–1941" illustration G 1. ^ The reorganisation Bruce describes had not changed since the Battle of Mughar Ridge. 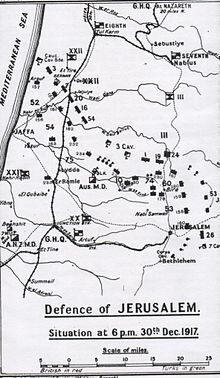 The Seventh and Eighth Armies still held a defensive line west of the Jordan, while the Fourth Army remained east of the Jordan. ^ These two victories resulted in unexpectedly large captures of Ottoman territory and prisoners. ^ Hart, Peter. "The Great War: A Combat History of the First World War". 2013. Page 409. ^ Cemal Kemal, The Last Battle of the Ottoman State on the Palestine Front, Ankara University [Institute for Modern Turkish History (Atatürk Yolu journal, number 45, 2010, page 59 (footnote 94))]. ^ Statistics of the Military Effort of the British Empire During the Great War 1914–1920, The War Office, p. 633. POWs held by the end of the war are given as 5,703 officers and 96,133 other ranks, broken down by ethnicity. However that total also includes "over 3,000" Austro-German men and 206 Austro-German officers, which are listed below separately. Ottoman POWs alone would therefore be 5,497 officers and about 93,000 other ranks. Of these 8,000 were captured by the Arab insurgents under King Hussein. ^ a b c Baker, Chris. "British Divisions of 1914–1918". The Long Long Trail. Archived from the original on 16 December 2011. ^ Wright, Edward (2 September 1916). "The Turkish Rout at Romani". The War Illustrated. Retrieved 3 May 2009. ^ Keogh 1955, pp. 54–56. ^ Powles 1922, pp. 29–35. ^ Woodward 2006, pp. 48–49. ^ Odgers 1994, p. 103. ^ a b c d Coulthard-Clark 1998, p. 122. ^ MacDougall 1991, p. 100. ^ Coulthard-Clark 1998, p. 123. ^ Gullet 1941, p. 247. ^ "53rd (Welsh) Division". The Long Long Trail. Retrieved 29 August 2012. ^ T. J. Mitchell and G.M. Smith. "Medical Services: Casualties and Medical Statistics of the Great War." From the "Official History of the Great War". Pages 15 and 201. ^ Mitchell and Smith, p. 209. "12th Light Horse Regiment War Diary (February–December 1916, February 1918)". First World War Diaries AWM4, 10-17-2, 13. Canberra: Australian War Memorial. 1916–1918. "1st Light Horse Brigade War Diary (May, June 1916)". First World War Diaries AWM4, 10-1-22, 23. Canberra: Australian War Memorial. 1916. "2nd Light Horse Brigade War Diary (November 1915 – September 1916)". First World War Diaries AWM4, 10-2-10 & 20. Canberra: Australian War Memorial. 1915–1916. "3rd Light Horse Brigade War Diary (April, June, September 1916, March 1917)". First World War Diaries AWM4, 10-3-15, 17, 20, 26. Canberra: Australian War Memorial. 1916–1917. "Anzac Mounted Division General Staff War Diary (March 1917)". First World War Diaries AWM4, 1-60-13 Part 1. Canberra: Australian War Memorial. 1917. "Imperial Mounted Division General Staff War Diary (February–March 1917)". First World War Diaries AWM4, 1-56-1 Part 1. Canberra: Australian War Memorial. 1917. Australian Army (1902). Mounted Service Manual for Mounted Troops of the Australian Commonwealth. Sydney: Government Printer. OCLC 62574193. Intelligence Section; Egyptian Expeditionary Force; Army of Great Britain (1917). Military Handbook on Palestine (1st provisional ed.). Cairo: Government Press. OCLC 220305303. Blenkinsop, Layton John; Rainey, John Wakefield, eds. (1925). History of the Great War Based on Official Documents Veterinary Services. London: HMSO. OCLC 460717714. Chappell, Mike (2002). British Cavalry Equipment 1800–1941. No. 138 Men–at–Arms (revised ed.). Oxford: Osprey Publishing. OCLC 48783714. Coulthard-Clark, Chris (1998). Where Australians Fought: The Encyclopaedia of Australia's Battles. St Leonards, Sydney: Allen and Unwin. ISBN 978-1-86448-611-7. Cutlack, Frederic Morley (1941). The Australian Flying Corps in the Western and Eastern Theatres of War, 1914–1918. Official History of Australia in the War of 1914–1918. VIII (11th ed.). Canberra: Australian War Memorial. OCLC 220900299. DiMarco, Louis A. (2008). War Horse: A History of the Military Horse and Rider. Yardley, Pennsylvania: Westholme Publishing. OCLC 226378925. Downes, Rupert M. (1938). "The Campaign in Sinai and Palestine". In Butler, Arthur Graham (ed.). Gallipoli, Palestine and New Guinea (Part II). Official History of the Australian Army Medical Services, 1914–1918. I (2nd ed.). Canberra: Australian War Memorial. pp. 547–780. OCLC 220879097. Duguid, Charles Scotty's Brother; Department of Repatriation Australia (1919). Desert Trail: With the Light Horse through Sinai to Palestine. Adelaide: W. K. Thomas & Co. OCLC 220067047. Erickson, Edward J. (2007). Gooch, John; Reid, Brian Holden (eds.). Ottoman Army Effectiveness in World War I: A Comparative Study. Cass Military History and Policy Series, No. 26. Milton Park, Abingdon, Oxon: Routledge. ISBN 978-0-203-96456-9. Esposito, Vincent, ed. (1959). The West Point Atlas of American Wars. Volume 2. New York: Frederick Praeger Press. OCLC 5890637. Evans-Pritchard, E. E. (1954). The Sanusi of Cyrenaica. Oxford: Clarendon Press. OCLC 13090805. Fromkin, David (2009). 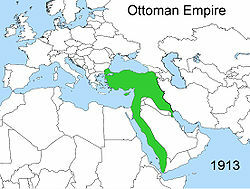 A Peace to End All Peace: The Fall of the Ottoman Empire and the Creation of the Modern Middle East. Macmillan. ISBN 978-0-8050-8809-0. Great Britain, Army, Egyptian Expeditionary Force: Handbook on Northern Palestine and Southern Syria (1st provisional 9 April ed.). Cairo: Government Press. 1918. OCLC 23101324. Gullett, Henry S.; Barnet, Charles; Baker (Art Editor), David, eds. (1919). Australia in Palestine. Sydney: Angus & Robertson. OCLC 224023558. Gullett, Henry S. (1941). The Australian Imperial Force in Sinai and Palestine, 1914–1918. Official History of Australia in the War of 1914–1918. VII (11th ed.). Canberra: Australian War Memorial. OCLC 220900153. Hughes, Matthew (1999). Gooch, John; Reid, Brian Holden (eds.). Allenby and British Strategy in the Middle East 1917–1919. Military History and Policy. I. London: Frank Cass. OCLC 470338901. Hughes, Matthew, ed. (2004). Allenby in Palestine: The Middle East Correspondence of Field Marshal Viscount Allenby June 1917 – October 1919. Army Records Society. XXII. Stroud, Gloucestershire: Sutton. ISBN 978-0-7509-3841-9. Hurley, Frank; Daniel O'Keefe (1986). Hurley At War: The Photography and Diaries of Frank Hurley in Two World Wars. Sydney: Fairfax Library in association with Daniel O'Keefe. OCLC 16709045. Jones, Ian (1987). The Australian Light Horse. Australians at War. Sydney: Time-Life Books (Australia) and J. Ferguson. OCLC 18459444. Keegan, John (1998). The First World War. New York: Random House Press. ISBN 978-0-3754-0052-0. Kinloch, Terry (2007). Devils on Horses: In the Words of the Anzacs in the Middle East 1916–19. Auckland: Exisle Publishing. ISBN 978-0-908988-94-5. Lewis, Paul (2014). For Kent and Country. Brighton: Reveille Press. ISBN 978-1-9083-3614-9. Liman von Sanders, Otto (1919). Fünf Jahre Türkei (in German). Berlin: Scherl. Retrieved 11 January 2015. Lindsay, Neville (1992). Equal to the Task: The Royal Australian Army Service Corps. I. Kenmore: Historia Productions. OCLC 28994468. Macmunn, George Fletcher; Falls, Cyril Bentham (1996) . Military Operations: Egypt and Palestine, From the Outbreak of War with Germany to June 1917. History of the Great War based on Official Documents by Direction of the Committee of Imperial Defence. I. accompanying Map Case (2nd (repr.) Imperial War Museum and The Battery Press, London and Nashville, TN ed.). London: HMSO. ISBN 0-89839-241-1. Macmunn, G. F.; Falls, C. (1930). Military Operations: Egypt and Palestine, From June 1917 to the End of the War Part I. History of the Great War based on Official Documents by Direction of the Committee of Imperial Defence. II. accompanying Map Case (1st ed.). London: HMSO. OCLC 6823528. Macmunn, G. F.; Falls, C. (1930). 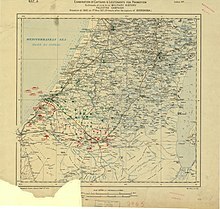 Military Operations: Egypt and Palestine, From June 1917 to the End of the War Part II. History of the Great War based on Official Documents by Direction of the Committee of Imperial Defence. II. accompanying Map Case (1st ed.). London: HMSO. OCLC 656066774. McPherson, Joseph W. (1985) . Carman, Barry; McPherson, John (eds.). The Man Who Loved Egypt: Bimbashi McPherson. London: Ariel Books BBC. ISBN 978-0-563-20437-4. Manuel, Frank E. (1955). "The Palestine Question in Italian Diplomacy, 1917–1920". The Journal of Modern History. XXVII (3): 263–80. doi:10.1086/237809. Massey, William Thomas (1920). Allenby's Final Triumph. London: Constable & Co. OCLC 345306. Retrieved 11 January 2015. Paget, G.C.H.V Marquess of Anglesey (1994). Egypt, Palestine and Syria 1914 to 1919. A History of the British Cavalry 1816–1919. V. London: Leo Cooper. ISBN 978-0-85052-395-9. Palazzo, Albert (2001). The Australian Army: A History of its Organisation 1901–2001. South Melbourne: Oxford University Press. OCLC 612818143. Paterson, A.B. (1934). "Happy Despatches". Sydney: Angus & Robertson. OCLC 233974420. Perry, Roland (2009). The Australian Light Horse: The Magnificent Australian Force and its Decisive Victories in Arabia in World War I. Sydney: Hachette. ISBN 978-0-7336-2272-4. Cecil Sommers (1919). "Temporary Crusaders". London: John Lane, The Bodley Head. OCLC 6825340. Woodward, David R. (2006). Forgotten Soldiers of the First World War: Lost Voices from the Middle Eastern Front. Stroud: Tempus Publishing. ISBN 0752438549.